Scientists are using hi-tech tags to get an insight into why the number of puffins at one of the UK's key colonies has mysteriously fallen by a third. Researchers are fitting a variety of the devices on the seabirds that are nesting on the Farne Islands, located off the Northumberland coast. 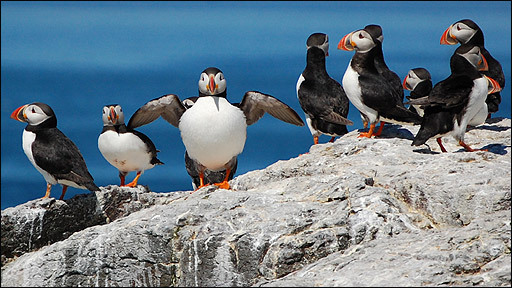 A survey in 2008 recorded just 36,500 puffins, down from 55,674 in 2003. The islands are considered a globally key site for seabirds, and are home to the largest puffin colony in England. "Our population, year-on-year, had been increasing," said David Steel, the National Trust's head warden on the Farne Islands, "and we had seen big booms in numbers. "In 2003, we hit an all-time high of 55,500 pairs, which was fantastic," he told BBC News. "In 2008, we conducted our survey again and we thought that it would be a brilliant year with up to 70,000 to 80,000 pairs. "However, we got the results and it was a disaster. In those five years, we had lost somewhere in the region of 33% of our breeding puffins." The reason for the sudden fall in the birds' population left scientists and conservationists both puzzled and concerned for the long-term future of the species in the North Sea. "The puffins leaving the Farnes were actually having some very good seasons," explained Mr Steel. "The adults were coming back, they were breeding well, the number of chicks fledging from the islands was superb. "Yet the birds were not coming back after the winter period, so what has been happening out there?" Richard Bevan, a biologist from Newcastle University, is leading the team that is tagging the puffins on the Farnes' Brownsman Island. He explained that a variety of devices were being attached to the birds. "A lot of tagging uses satellites, where the tag transmits to the satellite and then the satellite sends the data down to the researchers' offices," he told BBC News. "But we cannot do that with small birds, because they will not be able to carry the weight of the devices." Guidelines stipulate that the tags cannot exceed 4% of the bird's weight. On average, an adult puffin weighs about 400g, which means the attached tag must be no more than 16g. "So what we are using are 'GPS loggers'; They are basically archival devices because they store information rather than transmit it in real-time," Dr Bevan added. 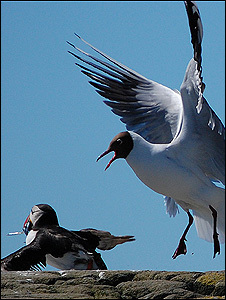 "The tag will record the position of the bird every minute. It will do this for about three to four days, during which time the birds will have been out on a number of foraging trips." 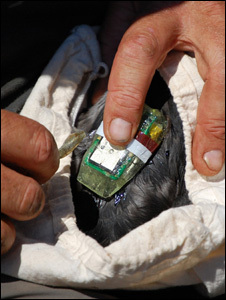 The devices are attached to the birds with a glue that weakens after about four days, allowing the tags to be recovered and the data downloaded. "Once we understand where they are going, then we can begin to look at why they go there." These tags, along with time/depth recorders that will show how the birds dive for fish, will offer a snapshot of the puffins' foraging behaviour during the summer months they spend on the Farne Islands. However, the researchers are particularly keen to understand where the birds go during the winter months because this is the period when many puffins are believed to perish. Dr Bevan explained that his team are fitting devices called geolocators, which are much smaller than GPS loggers and can be permanently fitted to a bird's leg ring. "That means that the bird can go away and do whatever it does, and as long as it comes back at some point then we will be able to get a record of where it has been." The tiny tags measure light levels, recording when dawn and dusk occurs each day. With this data, researchers can calculate day length, when midday occurs, and the daily longitudinal and latitudinal co-ordinates for the individual bird. "These devices are important for the out-of-breeding season because we know very little about what the birds are doing," said Dr Bevan. "We have got an idea that they are spending their time out in the North Sea, but are they? How much time are they spending out there? Where are they going? "What is happening in the winter is important. If there is something that is affecting the adults, then that has serious consequences for the species." Female puffins only lay one egg a year, so a high mortality rate among adults across a few years can quickly destabilise the population. It was not only the Farne Islands that saw a sharp decline in puffin numbers. 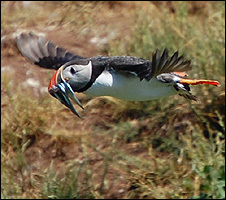 The UK's largest single puffin colony on the Isle of May, in the Firth of Forth, also recorded a substantial fall of at least 30% in 2008 from 2003 levels. Researchers led by Professor Mike Harris, from the Centre for Ecology and Hydrology, also noted that many of the returning seabirds arrived later than expected and were underweight. "Last year was a bad year," recalled Dr Bevan. "There were a lot of things that were strange. "We had about four weeks of strong easterly winds before the breeding season started; that was really unprecedented. "That may have affected sea temperatures, which in turn may have affected plankton growth, which would have had a knock-on effect on sandeel recruitment and growth," he suggested. "So, the decline could simply be an aberration of last year, but on the other hand it could be an indication than puffins are in serious decline around these shores and we do not know why." Dr Bevan and his team are hoping to publish initial results gathered by the GPS loggers in the autumn.